The legendary outlaw and leader blasts off on his next mission! Based off his unforgettable appearance in Guardians of the Galaxy Vol. 2, Star Lord is back in this amazing Light-Up Q-Fig FX Diorama. 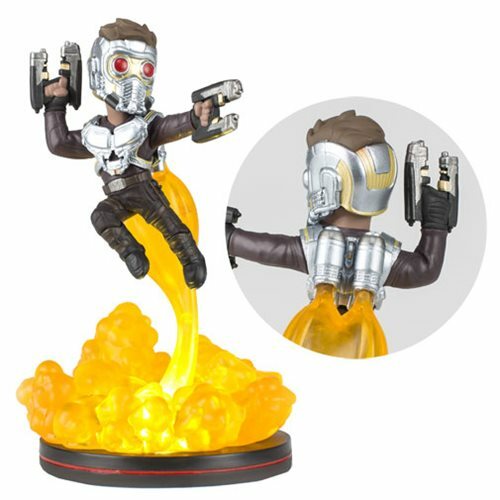 Measuring about 6 1/2-inches tall, this dynamic figure features Star Lord taking flight while leaving behind a glowing plume of smoke. This Guardians of the Galaxy Vol. 2 Star Lord Light-Up Q-Fig FX Diorama comes window packaging and requires 3 x "LR44" batteries (included).